AirAsia and the World Surf League (WSL) Australia / Oceania are excited to announce the extension of their partnership to support the three Australian Championship Tour events in 2019. As the Official Airline Partner of the WSL, the world’s best low-cost airline has unveiled an AirAsia Beach Club and the AirAsia Flight Cam at each event, beginning with the Quiksilver Pro and Boost Mobile Pro Gold Coast this week, and continuing through to the Rip Curl Pro Bells Beach and Margaret River Pro. AirAsia will also extend its ‘Surfboards Fly Free’ initiative in 2019, meaning surfers from Australia will be able to travel with their surfboard with no excess luggage cost, to any of the surfing hotspots found in AirAsia’s network of more than 140 destinations. “We are really excited to be continuing our partnership with a company that keeps the dream of the perfect surfing holiday a reality for Australians from all walks of life. We’re really excited about the continuation of these programs but especially the engagement of our fans through this partnership,” said Andrew Stark, General Manager, WSL Australia and Oceania. “Partnering with the WSL is a natural fit for AirAsia. Since announcing the deal last year, we’ve been able to showcase the breadth and depth of our fast-growing network. Take Padang in Indonesia, for example - the gateway to the Mentawais - where we now see thousands of surfers each year travel with us. This is what makes the partnership so unique,” said AirAsia Group Head of Branding Rudy Khaw. To celebrate the renewed partnership, AirAsia and WSL are offering two lucky winners with the chance to see pro-surfing at its best, including access to corporate hospitality and multi-day passes for each event. To enter, simply follow @AirAsiaAustralia on Facebook and look out for the competition details. 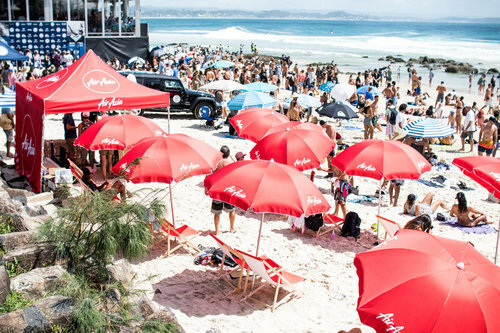 The AirAsia Beach Club is now open at the Quiksilver Pro and Boost Mobile Pro Gold Coast on at Snapper Rocks in Queensland, Australia.